Where is the environmental movement heading? After the Stockholm conference in 1972 the environmental movement became confrontational and opposed atomic power, dam building and the cutting of trees in many parts of the world. In the 1980s the third world finally got better organised with the help of Friends of the Earth and the Consumer organisation in Malaysia who both were active in setting up Third World network in 1984. The odd days when environmental organisations were close to eco-fascist ideas was long forgotten, especially after that the Indian government in many aspects tried to implement much of the sterilization ideas with the result that Indira Gandhi’s government fell in 1977. Gradually with the great help of tree huggers in India and tree planters in Kenya the environmental movement became more global with the interests of the global majority in mind. But at the same time at least the environmental movement in the West became more professionalized. By the end of the 1980s the politicians and business saw the need of responding to the growing global environmental concern. The Brundtland report issued by a commission in 1987 headed by the Norwegian social democratic prime minister launched the concept sustainable development. Now there was no more confrontations necessary, there were only a common responsibility for everyone to cooperate to bring about sustainable growth. In 1992 a new UN Conference on environment was held in Rio de Janeiro, this time more well planned by business and politicians to create an atmosphere of consensus for free trade as a solution to the environmental crisis together with Agenda 21, a plan of action were everyone could find something for their own cause. Most NGOs were happy and thus the environmental movement allowed itself to become the main legitimating source for the neoliberal world order under the over arching label sustainable development. In Sweden the independent environmental movement together with Finnish environmental and solidarity activists tried to oppose the Brundtland ideology but with little success. 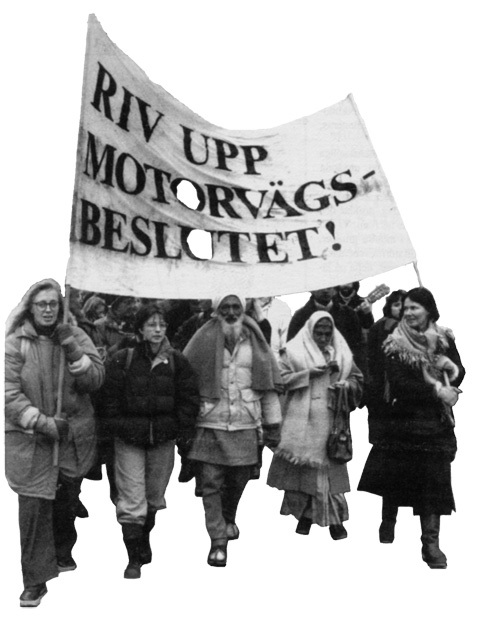 In Sweden environmental local groups started in the end of 1960s and established a national organisation in 1971 that split in 1976 due to strong criticism against top-down leadership. Environmental Federation (Miljöförbundet) was established that soon became a driving force in the anti-nuclear movement and protests against the use of pesticide in forestry. 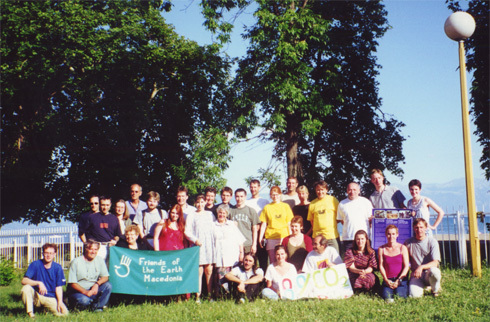 The organisation also took many international initiatives which resulted in the setting up of the International Secretariat on Acid Rain in 1981, European Youth Forest Action (EYFA) in 1986 and International Climate Action Days in 70 countries 1991-92 jointly coordinated together with Finnish organisations and EYFA. 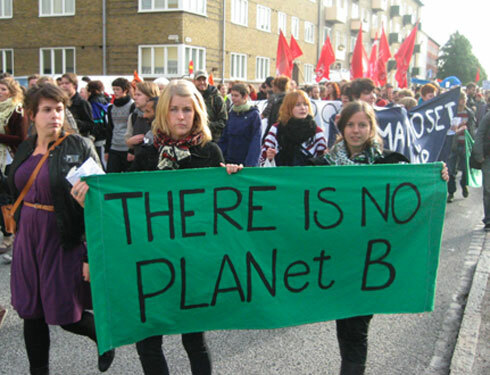 In many cases the Environmental federation was closer to youth environmental movements and third work environmental groups than to other Western environmental so called NGOs. In 1995 Environmental Federation primarily based on local groups merged with Friends of the Earth Sweden primarily based on individual membership. Miljöförbundet Jordens Vänner was established. At the time technocratic visions of how to solve the environmental problems became stronger at the same time as the movement had capacity to put forward qualified studies on how to change society. The result was the ambitious air share studies carried out in many countries all over the world by Friends of the Earth Group with Friends of the Earth Europe in the lead. The basic idea was that each person in the world had the right to her or his equal share of environmental space. This concept built on global justice enabled a vision were each nation should change its production and consumption patterns in such a way that the pressure on the ecosystem and natural resources should not exceed what was acceptable when every person in the world had equal rights to the access of these resources. But for some reason the main emphasis became technological instead of finding social allies in a common struggle for the vision. FoE Sweden and especially in Stockholm but also at national level continued to build alliances against the neoliberal strategies of corporations, EU, our own national government and at local level. What later has been labelled the global justice movement. We organised the European marches against unemployment through Sweden together with the syndicalist trade union and organisations for unemployed. 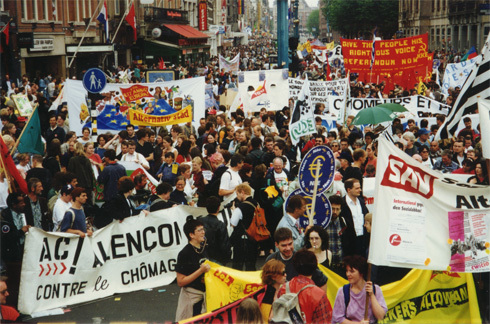 In 1997 we went to the EU Summit protests in Amsterdam 1997.and in 1998 we participated in the establishment of People Global Action against ”Free Trade” and WTO (PGA) in Geneva 1998. But we became more passive later when PGA mainly became anticapitalist and less involved in building strong alliances on antineoliberal issues. To us the environmental issue always have been connected to the issue of social justice both at the domestic and international level. Cooperation with other popular movements thus have been self evident and even part of our statutes, a fairly uncommon position in earlier days. The doors to the commission in Brussels was very much open to environmental NGOs in the 1990s and sustainable development became a key word in many EU documents. Year after year well funded campaigns demanding Greening the treaty was launched by FOEE with the only problem that few if any of the members in the FoE groups mostly positive to EU fedearalism wree interested in engaging oin the campaigns. 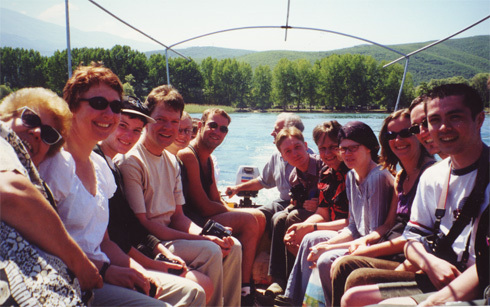 In 2000 I went to my first FoEE AGM in Macedonia at the Ohrid lake. It was a lovely place. The situation for the environmental movement on the Balkans was problematic and interesting. At the European level it was as often clear that FoE Sweden had the opposite position as many other FoEE groups. We together with FoE Norway and partly also FoE Denmark and FoE Finland were more sceptical towards EU or directly opposing EU as such. Already in the Rome treaty in 1957 market economy was placed above other issues. Thus if there was a contradiction between effective running of the market economy and social or ecological concerns the latter would be marginalised if one followed the treaty. As far as we knew EU had partly had good influence on environmental policy, at least in Southern Europe but in total the influence from corporations grew due to the way EU works and thus we maintained our opposition, much to embarrassment to big FoE groups as the German. To us it was less of a problem. When it came to actual issues we mostly easily could join the often hard criticism of specific EU policies or support EU against US in the hormone struggle. At a FOEE meeting during the EUI Summit in Gothenburg 2001 the controversies were finally settled and both parties started to know how to live with the difference of opinion concerning EU. Meanwhile UN tried again to organise a big conference on the environment, this time in Johannesburg 2002. It had not at all the same success as in Rio ten years earlier. One more Summit making unfulfilled promises on sustainable development and eradication of poverty did not have the same freshness any more. Instead Via Campesina and local anti privatization movements in South Africa strongly influence the alternative activities. World Social Forum and European Social Forum became popular but we followed the phenomena mainly on a distance with exception of a few interventions and organizing of local social forums in Sweden. What made us sceptical was the strong dominance of a left that did not understand ecological issues and to eager to cooperate with the trade unions. We also opposed that the Zapatistas were excluded from social forums as they were an armed movement. In this way one of the main inspirators of the global justice movements and their closest allies were excluded and thus social forums split the movement rather than uniting it. In 2008 European Social Forum was arranged in Malmö in Sweden. This time FoE Sweden decided to make an effort to make ESF more green. With the help of Via Campesina in Sweden and in Europe and FOEE we were able to achieve quite a lot. There were a lot of action during ESF in Malmö, the climate street occupation gathered some 800 protesters, many demonstrated against a deportation center and a weapon factory in Malmö and Friends of the Earth and Via Campesina organized a joint youth camp. For the first time environment became part of the main slogan for the joint ESF demonstration. ESF in Malmö became more action-oriented and the cooperation in Europe on food souvereignity and climate justice issues towards the Copenhagen summit was strengthened. Many other popular movements also claimed that ESF in Malmö was positive for them politically. NGOs and political parties were less influencing the programme. There was a problem that a French delegate stopped a proposal from Via Campesina to organise a joint seminar at the beginning of ESF for all social movements on how issues linked to each other. Such a board common debate on current political issues were missing mainly due to the dominant and contradictory French influence in the process. But for most parts movements from eastern and Western Southern and Northern Europe came closer to each other. Practically ESF in Malmö was much of a disaster. It ended with bankruptcy pushed for by trade unions that did not want to do the work needed for saving the economy afterwards. If it was not for the translators and cultural workers that did not get their expenditure paid one could laugh about the left and its incompetence in organizing and mobilizing to a political event. Filled with the latest fundamentalistic ideas about open space and attempts at depoliticizing the event by claiming that nothing was allowed to be predefined the left with trade unions and Attac in the lead organized their own failure with a lot of gestures about being horizontal, democratic and transparent. When there was a conflict between hiring a professional for doing the some of the website job or trusting the volunteer group the majority in the board choose the professional option, without having the money for it. The result was that the volunteers and the treasurer left the organisation and the website still took very long time to be established. The whole organisation imploded as the horizontal ideology of the left prohibited any political motivation for taking joint responsibility for the ESF and instead helped those that saw the event as a market place and open space for their own organisation. Those that choosed to oppose the treasurer and the volunteers in the information group had not thought about the consequences and had no experienced treasurer to put instead of the treasurer they forced to leave nor any volunteers to be able to establish an information group again. The organisation was on the brink of collapsing. After ESF when it was clear there was a deficit the very many promoters of the open space and professional horizontalism were no more to be seen. 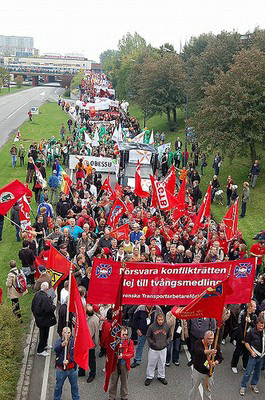 It became the local volunteer activists and those organisations that had opposed the expensive horizontal professional solutions and market oriented open space ideology that took the initiative to collect money for the debts while the Swedish trade unions did much for hindering constructive solutions and putting ESF into bankruptcy as fast as possible. FoE Sweden had not much to loose on ESF showing itself to be incompetent as it generally is considered to be a project of the left although the World Social forum declaration is a lot broader than that. But leaving volunteers and cultural workers with a debt when there was something one could do about it was not seen as morally or politically the right thing to do. Thus FoE Sweden is still strongly involved in organizing a collection campaign for the ESF debts and a follow-up on ESF in Sweden. FoE Sweden also continued the political cooperation that started with many organisations in opposition to the anti-political side of the open space concept. With FOEE and Via Campesina the relations became strengthened through the cooperation at ESF It seemed as if there were new possibilities for wider international cooperation between popular movements and a new openness for this in Friends of the Earth. Thus when there was time for next FOEE AGM to take place in Lenzen in northern Germany I was interested and sent as a delegate for FoE Sweden. After almost four decades of involvement in local, national and international environmental movement and a decade after my first FOEE AGM in 2000 it was time to go and see what had happened to one of the key organisations in the environmental movement. In next chapter you will get a report from this meeting.